Very nice. I absolutely love the “randomness” of your bench, with all the different species represented. This really makes me want to get to work on mine, like yesterday! Yep, it’s a real mutt of a bench, isn’t it? 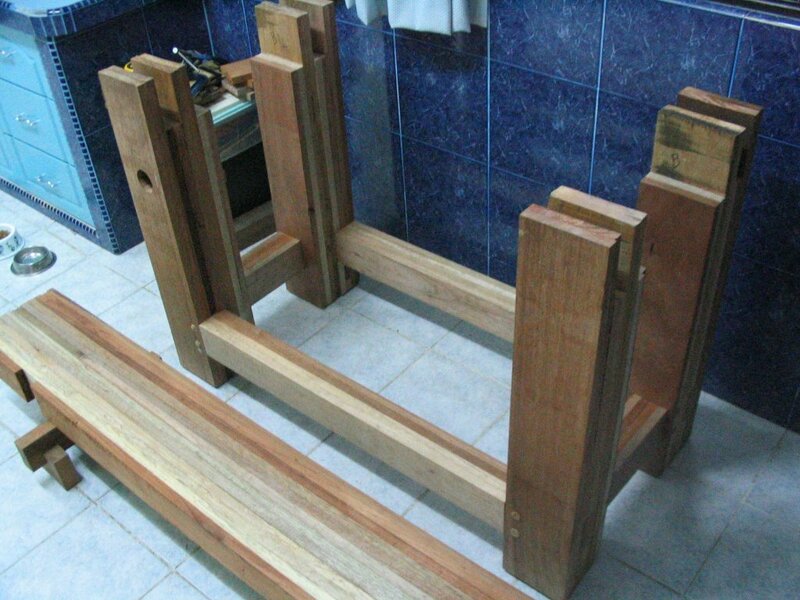 I just bought my leg vise chop today – another species of wood – and two more boards for the outermost boards of the benchtop (the ones I had were too soft) – yet another species. It’s fun! Wow Eric! Your bench is really coming together! I’m having dreams of finding a house and building my own now via hand tool power! HAND POWER! I make lot errors in sizes too. lol. I will spend days thinking it should be a certain size and never bother to research it. Now, I try to remind myself to check the measurements two, three, four times even…until I no longer doubt myself. In your case the 3/4 size really worked to your favor! It looks great so far and I can’t wait to see the finished bench…almost there, man! Thanks dude! Yeah, it’s kinda nice to be practicing my woodworking, joinery, etc. on something that’s big and industrial. You can screw it up and it will still most likely function just fine. I’ll have to remember to be a little more precise and a little less relaxed on “real” projects! Now you know I’m no fine furniture bench crafter, but I don’t think that even I could have left the hole there. And anyway, it was directly adjacent to the real hole (you may be able to see how close – about 1/8″ in between), so I kinda needed the wood to be there to support my clobbering of the peg with my mallet! For me the problem was that I was never able to line up the holes with the drill, but I bought myself a cordless drill, well balanced, long batteries… and I am a pro now! The best thing that a bought so far.